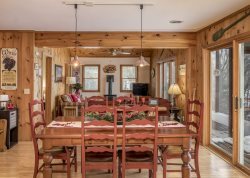 Reel in a Real Good Time by choosing a vacation rental with Northwoods Home Rentals, where you have landed an area full of unparalleled fishing opportunities! Vilas County is perfect for both serious anglers and families just looking to cast a line! It’s home to more than 1300 lakes and 73 streams and rivers just waiting for you to try your luck at catching your Friday Fish Fry. There are so many lakes to choose from, where do you start? A number of our vacation rental properties are on the Manitowish Chain of Lakes which is popular for muskellunge, northern and pan fish angling. You can also find fantastic fishing even if you’re trying to reel in some fun from shore. Try the accessible piers and shoreline fishing found at Upper Gresham Lake in Boulder Junction, Rest Lake Park in Manitowish Waters, Star Lake in Sayner / Star Lake and many more. Click HERE for a list of public access lakes you can explore while in the area! Maybe Trout are what you seek. If so check out Stormy Lake in Conover which is a 522 acre lake that the DNR keeps well stocked with Brown Trout. Or you can try one of the dozens of trout streams in Vilas County like the Deerskin River near Eagle River. Nearby Iron County boasts the Turtle Flambeau Scenic Wilderness Waters area and Trude Lake where you will find nearly 19,000 acres of fishing paradise. This large flowage is the result of the construction of a dam in 1926 that created this fishing destination and resivoir. The Turtle Flambeau Flowage and Trude Lake will provide you with the ultimate in Northwoods Wisconsin fishing opportunities as you will find muskellunge, smallmouth and largemouth bass, pan fish such as crappie, perch and bluegill and walleye. But this incredible body of water is best known for the abundant walleye it holds. If you’re in search of great walleye fishing, this is the place for you. There are six boat launches on the Turtle Flambeau Flowage, one on Trude Lake and one on Lake of the Falls. From these boat launches you can access these waters by boat, canoe or kayak. Because the flowage is such a large expanse of water, you may want to consider hiring a local fishing guide that can help you find the hotspots to catch your limit during your Northwoods Wisconsin vacation. Click HERE to discover more about the scenic Turtle Flambeau Flowage. The Northwoods of Wisconsin is also home to many fishing tournaments throughout all the available fishing seasons. Click HERE for a list of the many fishing tournaments that you could enjoy during your as you plan your ultimate fishing focused Northwoods Wisconsin vacation.